A wedding is a turning point in every girl's life, and for that special day, the bride will wear a beautiful wedding attire. When you hear the term "wedding dress", do you first think of a western wedding dress or the Japanese white wedding kimono? Both are beautiful pure white costumes, equally suitable for the occasion, and it is natural for brides to hesitate when it comes to choosing between the two of them. 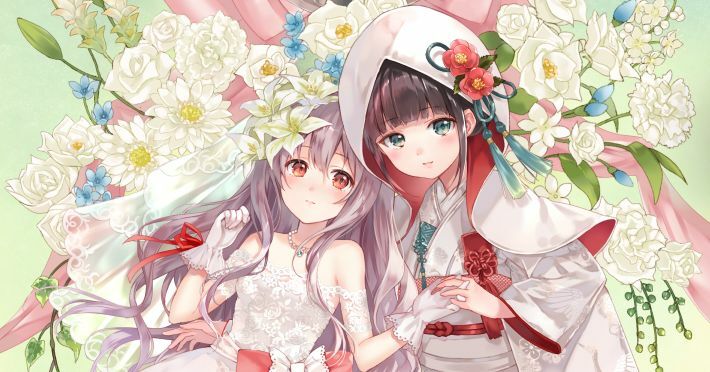 Today we are featuring illustrations of girls in western wedding dresses and the Japanese white wedding kimono. What would your beloved one wear? Please enjoy!